Brexit Briefing - Where Are WE Now & What Happens Next? 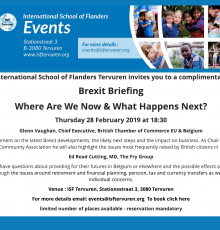 Where Are We Now & What Happens Next?International School of Flanders Tervuren invites you to a complimentary Brexit Briefing. Glenn will comment on the latest Brexit developments, the likely next steps and the impact on business. As Chair of the Brussels British Community Association he will also highlight the issues most frequently raised by British citizens in Belgium. Many people have questions about providing for their futures in Belgium or elsewhere and the possible effects of Brexit. Ed will take us through the issues around retirement and financial planning, pension, tax and currency transfers as well as answer individual concerns.